If you like rainbow moonstone, you'll love labradorite. It's characteristic labradoresence glows with greens, blues, turquoise and gold. The colours are dramatic and change as the light plays on the surface of the stone. 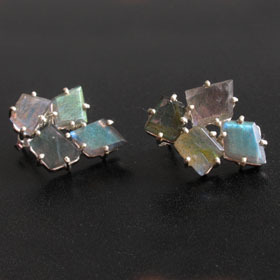 Shop here for labradorite cluster earrings, labradorite drops, and statement labradorite earrings. Check out our collection of labradorite pendantsand labradorite bracelets to make a set. 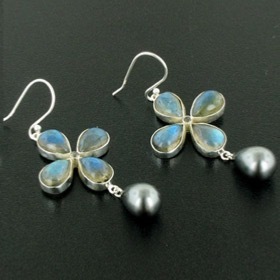 Free delivery anywhere in the UK on our labradorite jewellery. Labradorite and black pearl droplet earrings set in sterling silver.